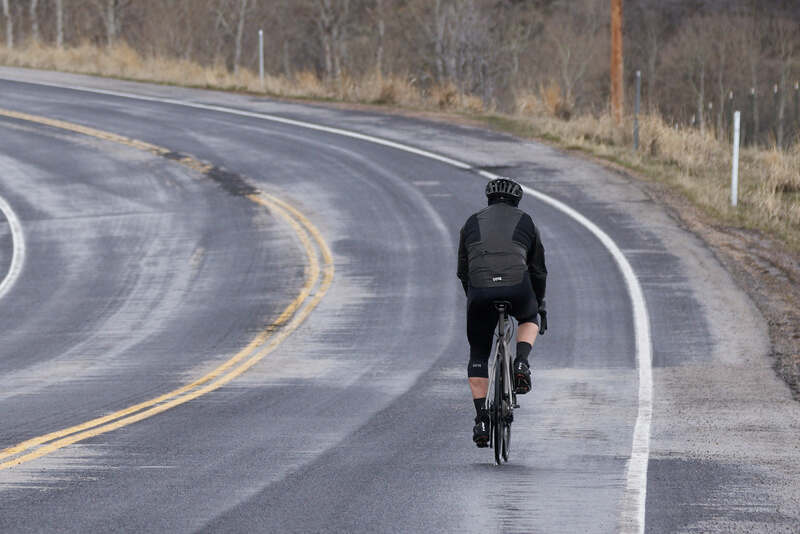 If you’re trying to understand why a cycling rain jacket costs $369 instead of $29, here’s why: it’s ok to sweat in the Gore-Tex Stretch Jacket and keep it on for the whole ride. 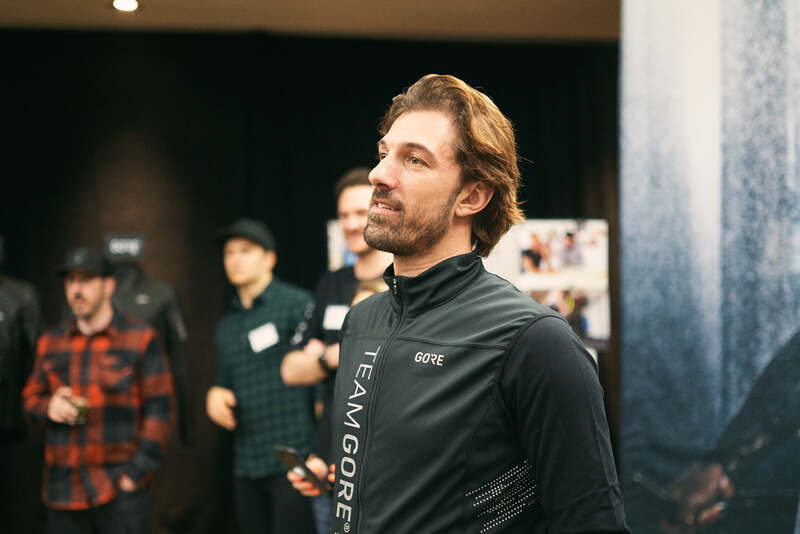 What Gore-Tex started as the One has been iterated to include stretch panels and the result is a closely fitting jacket that will flap less in the wind, hug the body closer, and provide unrestricted movement while training, racing or just riding. Gore Stretch Launch in Park City. With a proper liner underneath, it’s all you need to wear in the rain. Out for a ride in Park City—it was cold. Compared to the clear plastic bags with sleeves cyclists used to put on when it rains and sweat profusely in, the technological advantage is…well, obvious. 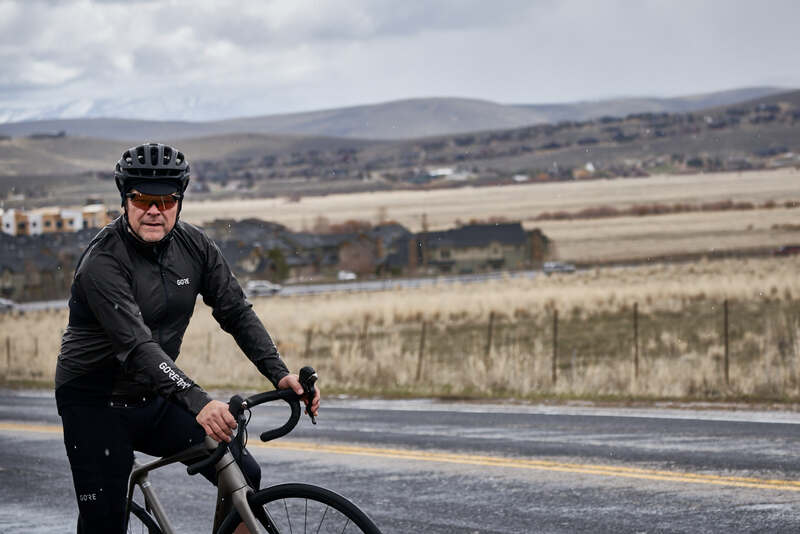 It doesn’t get that cold in the Pacific Northwest, so cyclists sweat out their jackets and try to start the ride feeling a chill, so as not to overheat. Now, if it’s gonna be a wet ride, the Gore-Tek ShakeDry (and the other variants) is on from start to finish with maybe a zip down or up a bit to modulate the microclimate. Kit up and go comfortably without ever retreating the jacket either. The surface permanently beads. The stretch works like it does in any other garment adding comfort and putting the membrane closer to your body so it can perform best. As with all the jackets in the ShakeDry line, the outer face fabric is no longer necessary (with exceptions for durability) and comfort is the key feature. Riding mostly off road these days, I’ll unzip to my chest during a climb, then right back up for the loop, and the descent. 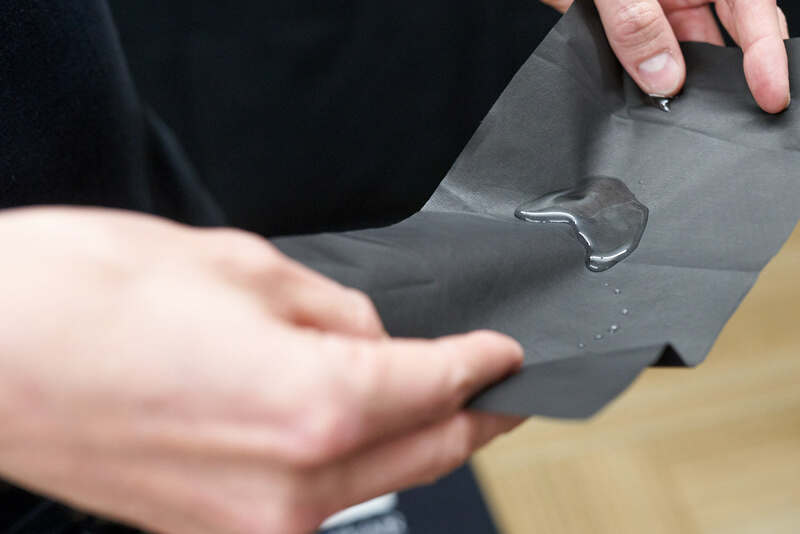 You just can’t backpack with a ShakeDry or Stretch jacket, because there’s no outer layer. That’s not a problem for me because I prefer a fanny pack and now through the spring I pack the jacket either in the boxy-bike bag or in a jersey pocket if I’m riding road. The trick is to flip the alcohol into your mouth from the membrane without spilling a drop. Potentially lost in the rapid release pace for Gore is how advanced the product is. The assembled media, including me, learned as much during the launch, where Gore presented the stretch version like a science fair with stations demonstrating how the tech has evolved. 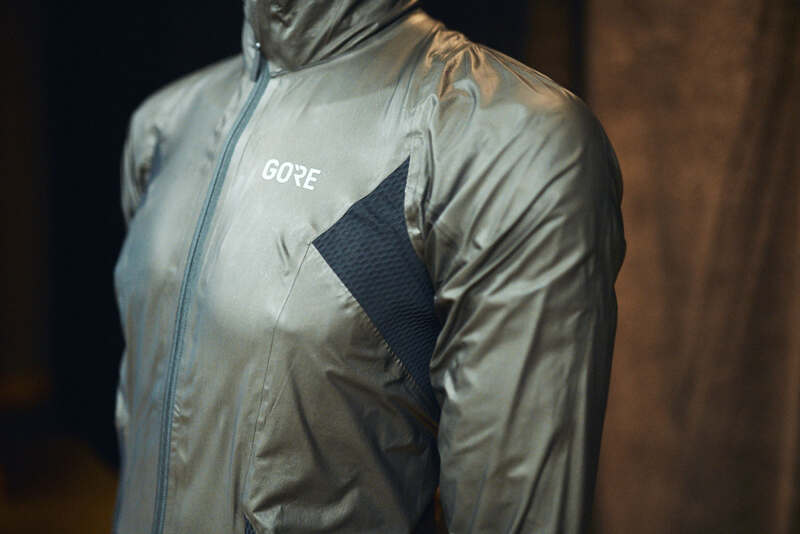 Most interesting we learned Gore’s founder originally envisioned this jacket nearly 50 years ago and they finally now have the tech to make it a reality. The stretch panels, also made of Gore materials, are privatized military tech developed to be worn with bulletproof vests. Gore Stretch fabric was developed for the military. 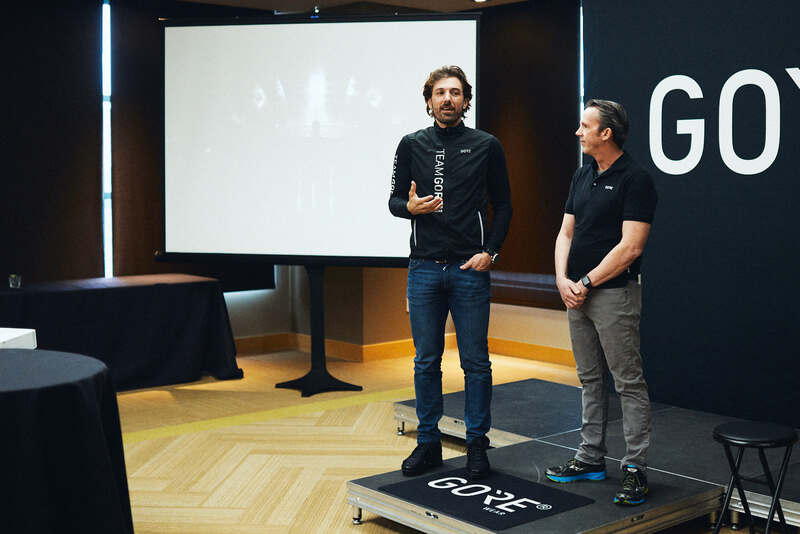 Fabian Cancellara is Gorewear’s brand ambassador and was on hand for the launch. He explained the best version of the samples he tried is worn closest to the skin, but that was overly constricting. The stretch panels under the arms and upper back allow for a tight fit with less constriction. Fabs flew in from Bern to hang out with the media during the launch. I’ve been waiting for this jacket and technology to come to production for a long time: it’s ultra-lightweight and super breathable; it fits into any jersey pocket, it’s completely waterproof and it fits like a second skin thanks to the stretch inserts. And, because it breathes so well the jacket can be worn in warm but wet conditions, as well as very cold situations, whether or not it’s raining. I have the running version with a hood and just wear it around as a shell. When traveling, it’s particularly useful because it packs down so small and is light. Fabs worked closely with Gore on the tech. What Gore didn’t share with us is his how they print colors on a beading membrane, but somehow they do. While the jacket is grayish black, color accents pop on gray days or nights. Gore-Tex ShakeDry jacket is available now from Competitive Cyclist and Gorewear for $369. 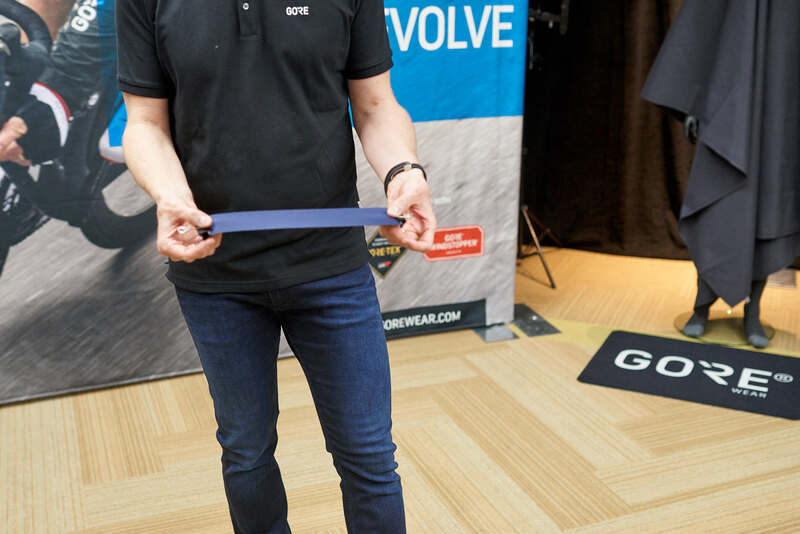 What you need to know is, by combining Shakedry with stretch technology borrowed from the military, Gorewear has released a cycling jacket that’s been engineered to create a closer fitting and more sculpted jacket while keeping overall weight very low with little bulk or noise. It’s absolutely worth $369, unless you prefer to sweat out in a plastic rain cape of course. Ride all day in stretch, I wear the running version to travel with.